Note: This is an occasional, verse-by-verse commentary on the book of Jude. 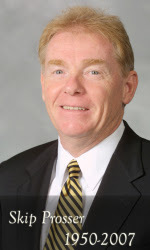 Previous commentaries may be viewed by clicking on the "Jude Exposition" label below. In Jude 1:5 we heard the sobering word that after the Exodus God destroyed those coming out of Egypt who did not believe. The theme of judgement continues in v. 6. God has authority to judge not only men but also the angels. 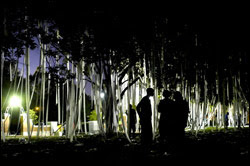 Jude assumes an underlying narrative that we must admit we know little about. At some point in history, in an incident not clearly described in Scripture, some of the angels apparently rebelled against God’s good design by not keeping "their proper domain." Some speculate that passages like Isaiah 14:12-14 (beginning, "How you have fallen from heaven, O Lucifer, son of the morning!") refer to this cosmic, angelic rebellion. This may be, but we must be careful not to tread beyond the sure boundaries of Scripture into unfruitful speculation. The Bible does not tell us everything we possibly could know. It tells us everything we need to know to make us "wise for salvation" (2 Tim 3:15). Whatever the circumstances of their rebellion, it is clear that God soon subdued these rebel angels, and that he holds them for a final day of judgement. They are "reserved in everlasting chains under darkness" awaiting "the judgement of the great day." In 2 Peter 2:4 we likewise read that "God did not spare the angels who sinned, but cast them down to hell [Tartarus] and delivered them into the chains of darkness, to be reserved for judgement." 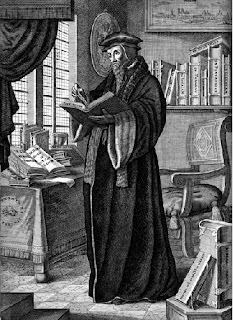 The warning Jude impresses upon his hearers is that the false teachers, "certain men who have crept in unnoticed" (v. 4), face a similar fate as the rebellious angels. If God did not spare angels, he will not spare men. These false teachers have also left their "proper domain." They distort the truth of God. Their end will be judgement at the "great day" (likely a reference to the second coming of Christ, described as "the day of Jesus Christ" in Phil 1:6 and "the day of the Lord" in 1 Thess 5:2 and 2 Peter 3:10). In addition to this dire warning, the believer may also breathe a sigh of relief. Thanks to the righteous life and atoning death of Christ, "God did not appoint us to wrath, but to obtain salvation through our Lord Jesus Christ" (1 Thess 5:9). If God did not spare these angels, why would he save sinful men? Have you ever considered that at the time of Jesus’ second coming, not only men but also angels will be judged by Christ? Are you ready to stand before the judgement seat of Christ (see Rom 14:10; 2 Cor 5:10)? Though I am not in general an avid supporter of my undergraduate alma mater (to know why, read this book), I do like to follow its sports teams. 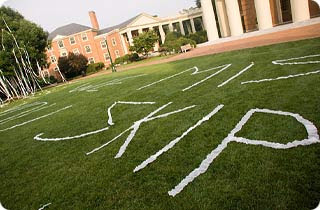 It was a real shock to read the news this week of the sudden death of Wake basketball coach, Skip Prosser, at age 56 (the quad was rolled in his honor). It serves as another reminder, if we needed it, that "the grass withers and the flower fades" (Isa 40:8) and that no man knows his time (Ecc 9:12). Somehow people are not supposed to die in places where you spent your youth. Tomorrow afternoon I will get another reminder of our frailty as I lead a funeral service for a 91 year old woman. Thanks again to Steve Hills for sending me this link for the newest Geico ad. I also like the post on the same site, "TULIP VBS brings shocking response from parents." At the end of the week, we took a Saturday (7/7) trip into Budapest. While there we visited the Szent Matyas Templom in the Buda Castle district. This ancient church was the site of the coronation of Istvan (Stephen) the first Christian king of Hungary a thousand years ago. It was converted into a mosque when the Turks controlled Hungary. Legend has it that the battle to retake the building was turned by an apparition of Mary to its Muslim defenders. While inside we visited an upstairs church museum which contained numerous relics, including a shriveled foot of some saint and a tooth from St. Francis of Assisi. 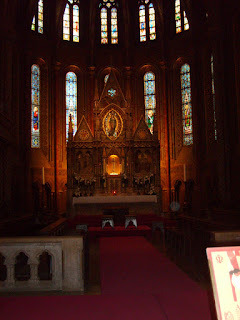 Before we left the dark, cavernous sanctuary, I had to pause to give thanks for men like Luther and Calvin and the other Reformers who recovered the gospel and proclaimed it throughout Europe and into places like Hungary. What courage it must have taken to boldly preach Scripture and proclaim its focus on Jesus as the one Mediator between God and men rather than on Mary and the saints! What incredible superstitions they must have encountered with the truth of God’s Word! Adapted from Call to Worship on Sunday, July 22, 2007. Last week I drove by a local bookstore and noticed a long line of people flowing down the sidewalk. They were waiting for a ticket to be able to purchase the much-hyped new release in a popular series of juvenile fiction. Seeing that line led me to ponder our hunger for reading the Word of God. Do we have as strong a desire to read the Holy Scriptures as these have to read a work of fiction? Nehemiah 8:1 Now all the people gathered together as one man in the open square that was in front of the Water Gate; and they told Ezra the scribe to bring the Book of the Law of Moses, which the LORD had commanded Israel. 2 So Ezra the priest brought the Law before the assembly of men and women and all who could hear with understanding on the first day of the seventh month. 3 Then he read from it in the open square that was in front of the Water Gate from morning until midday, before the men and women and those who could understand; and the ears of all the people were attentive to the Book of the Law. Can you imagine being so hungry to hear the Word of God that you would gather with a throng of people "as one man" to hear "the Book of the Law of Moses" read "from morning till midday"? Some of those in that square had gone years in exile without hearing and understanding the Word of God. They were starving to hear a word from the Lord. Each Lord’s Day when we gather for worship we are declaring to the world that we hunger to hear and receive God’s truth. May God make us attentive to the hearing of his Word. A couple of years ago, we started a tradition of family day trips on summer Fridays--my official day off from work. I found that if I stayed home I ended up working, studying, emailing, etc. Last Friday, our family took a trip Westward over the mountain. We hiked Humpback Rocks on the Skyline Drive and walked though the Appalachian farm display. Llewellyn bought "Living with Chickens" in the park bookshop to know better how to care for our brood. We then drove over to the Cheese Shop in Stuarts Draft. You have to love this little Mennonite owned store with all its unique goods and natural foods. I also like the Scripture sign outside the business. You see these signs all over the little town. Quite a different culture over in this area. We then stopped in at the P. Buckley Moss Museum, which I did not realize was free to visit. It was a good family day. It is hard to describe the energy of Pastor Racz Lajos (The first name is "Lajos"; Hungarians place last name first and first name last). 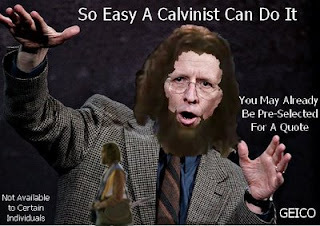 I said the other day that if he had not been a Pastor I think he would likely have been a very successful business-man. Lajos has an entepreneurial spirit which aids him immensely as a church planter. Lajos has drawn a cadre of other young families to his ministry. He typically trains them for a season and then sends them out to plant churches. I first met Lajos 17 years ago when he was in his early 20s and a student at the Hungarian Baptist Seminary (then located on the Rozsadomb in Buda-it has since moved to its pre-WW2 location in Pest, reclaiming the building which the communist government took away without compensation and gave over to the North Koreans to use as their embassy). 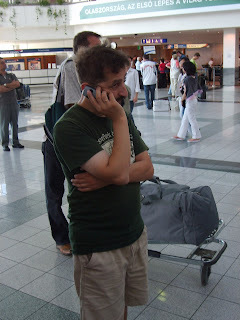 Lajos was constantly on the phone while we were there. He is married to Mariann and God has blessed them with four children (a son Manase; twin girls, Ana-Abia and Priscilla; and a newborn son Jakim). Both Lajos and Mariann have a Jewish ethnic heritage. One thing I noticed while in Bicske was that it seemed the families (especially of believers) were larger than I had remembered when I lived in Budapest. It may just have been that we were in the country and not in the city, but I do not think this was the only factor for the believers. Hungary, like the rest of Europe, is facing rapid population decline. I was talking to one young couple in the church (Ilona and Miki) who have two infant children and telling them that some Christian families in the US are also getting larger and some have embraced this as a strategy for long-term culural influence ("if you can't beat 'em, outbreed 'em) not to mention obedience to the Gen 1:28 mandate. 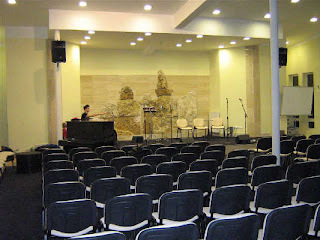 We were all impressed with the new church building at Bicske. When we were there four years ago the church's only building was a small structure about the size of a double wide trailer that had previously been used as a pub and a horse stable. 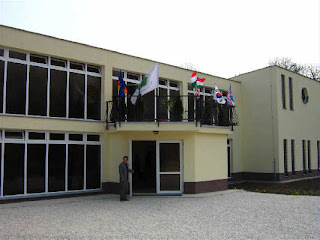 They were in the process of building a new building with their own labor when a German company came along who wanted to buy their property--located near the main highway between Budapest and Vienna and on the main road into Bicske. They negotiated selling a parcel of their land and having the German company construct a brand new building. 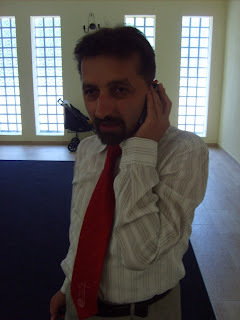 Pastor Lajos could only describe it as a great 'csoda' (miracle). 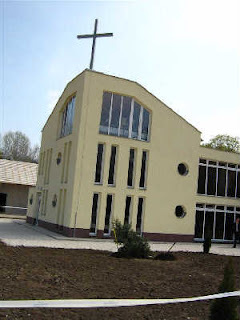 Bicske, a town of 10,000, now has a Catholic church building, a Reformed (Presbyterian) church building, and an impressive Baptist meeting house. The building holds a sanctuary, offices, and apartments to be used for housing faculty for the Bible College. It also stands out visibly from the highway. 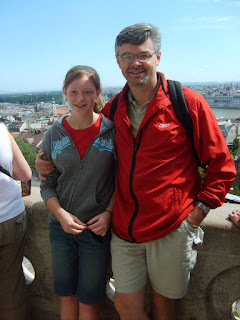 My daughter Hannah and I in front of the Fisherman's Bastion in Budapest. 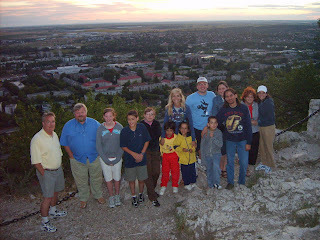 JPBC-ers and Bicske-ers overlooking the town of Tatabanya, Hungary. OK, Howard I'm finally getting around to a new posting. We're back from Hungary. Today is the first day that I've felt like I had a real handle on my jet lag. This was my third trip back to Hungary after living there from 1990-92. I made previous trips in 2000 (to Bekes) and in 2004 (to Bicske). Every time I go back it seems the country has changed more and more from those early post-communist days of 1990-92. Listening as Chip Case and Amy Scruggs presented powerful personal testimonies in Sunday morning worship at Bicske.